Find out how to make your car "pop" with chrome accessories. You’re driving down the road…and on your radio Michael Hutchence and INXS are crooning, “Shine Like It Does.” Next up it's Pink Floyd’s “Shine On You Crazy Diamond.” Is the world sending you a message. Yes, yes it is. Your ride needs a little shine—something more than what your local car wash can provide. You need some shine of a different level: chrome accessories to get your ride shinin’ like it should. So what are the best chrome accessories on the market? From chrome tail light covers to chrome door handle covers, there is a plethora of shine available to channel your inner bling and take your ride to the next level of style. For example, Toyota Tundra chrome door handles are a popular choice among those who seek the shine of chrome. Try the AMI fuel door F150 type in chrome. Your truck will be rollin’ in rare form with this beautiful bit of brilliance. Or how about a chrome gas cap? This baby will give your ride the boost they’re all singing about and may be the perfect accessory to add some shine to your rig. 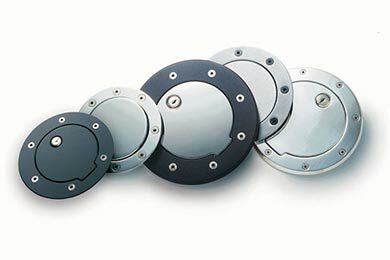 Another choice for the best chrome accessory to add some gleam are Putco mirror covers, which will give your vehicle that limited-edition style without the premium price tag. From Dodge Ram mirror covers to any vehicle in between, this is one of the most popular choices for a subtle dash of shine. Not content to stop with chrome door handles or gas caps? Go the distance with chrome pillars, or one of the many chrome packages on the market, to get your ride ready to roam the road in sleek shiny style. What's the Right Chrome Accessory for Your Vehicle? Dial in your ride with the wide variety of chrome accessories on the market—and the next time you hear Billie Holiday crooning “Come Rain or Come Shine,” you’ll be able to drive down the road knowing your gleam is giving your ride the shine it deserves. Very pleased with the product. Looks great, good quality and a breeze to install. This is a great product!!! It looks great on the Acura. 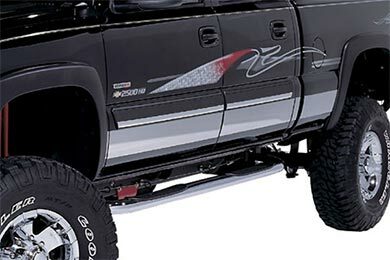 I want to order the Black fuel door cover for my 2000 ford F150 4x4 Lariat. But, I looked at the video my door does not come off that way. Instead, the hinge is lipped to the cover. Hello. The video is an example. Please allow me to assure you that the fuel door cover you order will be specific to the dimensions of your vehicle in all aspects. Thank you for your question. These are a universal product and are not vehicle specific. You simply cut them to fit. If you are looking for a custom fit product, check out the SES Chrome Pillar Post Trim . Reference # 766-176-357 © 2000-2019 AutoAnything, Inc.